I will be going into two music stores in my area when my 3/4 .660 bore Eb tuba arrives, to test drive mouthpieces to get for it. Since I only have larger mouthpieces with deep cups and throats that aren't suitable for a 3/4 Eb. Anyone have anything they recommend I take a look at and test drive? Also, is even a Helleberg (120S) too large of a mouthpiece? Would a 7B be work, or do I need to look for even smaller mouthpieces? Thanks and Best! For what it’s worth, Oystein Baadsvik plays a 120s with his miraphone Eb. It is not to large. Most plays of the small Eb’s use a smaller shallower mouthpiece. A Denis Wick 3 is popular. I have used a Sellmansberger solo and imperial. I also like the wedge SJ. A 24 AW is popular in England. I use a Wick 3L on my King. It has a more focused sound than others I have used. It's great to hear that music stores in your vicinity carry a range of tuba mouthpieces that you can try. I'd try that 7B, if they have it - it's a very popular mouthpiece, if you get along with a moderately sharp rim. But ... I don't know the situation, if you really feel like you'd better limit your test to a couple items, you could just skip the 7B test and mail order the excellent Faxx copy sight unseen, as it isn't terribly expensive. It takes me a while to really compare a mouthpiece - like, days, weeks - so it's nice to just own a few even if some of them are losers. The ones you'd really ought to try in the store are the more expensive ones they happen to have, so you can can satisfy yourself that more expensive mouthpieces aren't really better. One example that jumps to mind is the Schilke 62, a classic and pretty good bass tuba mouthpiece that I don't think you could get very economically. I'll be interested to hear what you try, and what you end up with. I guess one of the reasons people choose smaller, shallower mouthpieces with a bass tuba, is that they're aiming for a different sound. 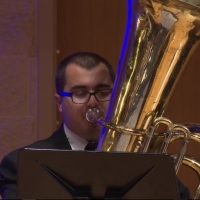 If you were really hoping to sound more or less the same, as on contrabass tuba, then the mouthpieces you have might work out OK.